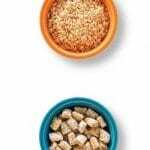 Breakfast Cereal Hacks Mix, Coat, Swap and Top | JPMA, Inc.
Iron, which your body uses build blood cells that take oxygen from your lungs to the rest of your body. Folate/Folic acid, which helps with cell growth and development. Fiber (from whole grain options), which helps keep you regular and helps you feel full after a meal. Certain fibers can also help control blood cholesterol levels and prevent heart disease. Breakfast Cereal Hacks for Better Health. Breakfast cereal can be used in a variety of ways outside of breakfast to help you save money on delicious family meals. Swap crushed cereal for breadcrumbs for any recipe that call for them. Swap seasoned corn or rice flakes for expensive croutons and salad toppers. Coat chicken or fish with crushed corn or rice cereal to make crisp lower fat oven fried family favorites. Mix crushed rice, corn, or wheat flake cereal into meatball, meatloaf, or meat patty recipes. Top desserts or casseroles with crushed cereal drizzled with butter or sprinkled with cheese.